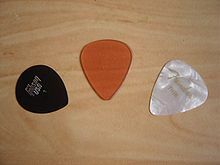 A plectrum is a smaa flat tuil uised tae pluck or strum a stringed instrument. For haund-held instruments such as guitars an mandolins, the plectrum is eften cried a pick, an is a separate tuil held in the player's haund. This page wis last eeditit on 1 September 2014, at 19:17.